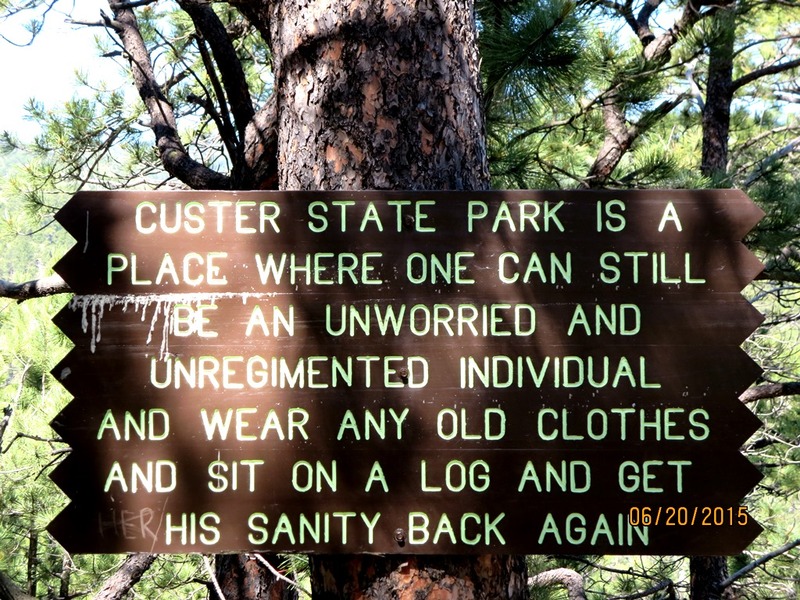 I didn’t want to go on the Lover’s Leap hike in Custer State Park that morning. I wanted to be writing, but I hadn’t written anything significant for weeks, so I couldn’t see much point in going to the computer. The description of the hike made me nervous because my left knee is unreliable after numerous injuries, so sometimes it’s painful or causes me dangerous stumbles on rough surfaces. Since the proposed hike was described as “strenuous,” with “many” creek crossings, I was afraid of the consequences. I also believe in exercise and in testing my limits. This spring’s stormy weather has kept us away from our usual weekend hiking regimen. Flash floods have occurred in many areas of the Black Hills, and trails have been soggy. Since the morning’s weather looked dry, I was anxious to inaugurate summer the day before the solstice with a good hike. 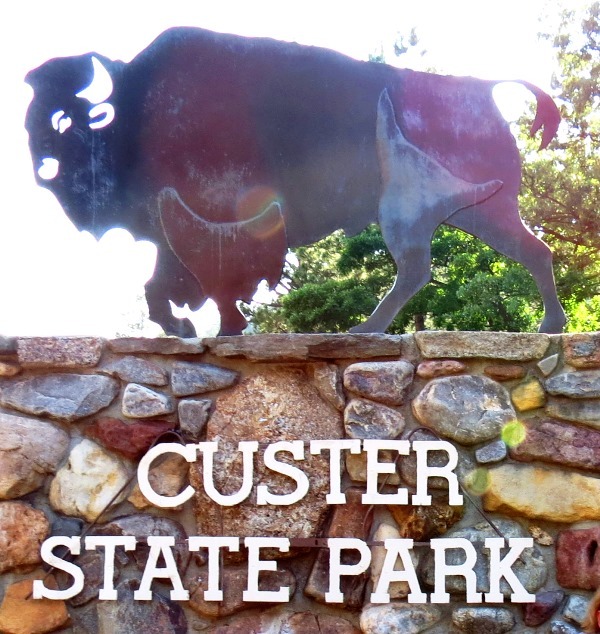 So we drove into Custer State Park on U.S. Highway 16A and tucked our car into the lot behind the old schoolhouse slightly north and across the highway from the Norbeck Visitor Center. We looked at the topographic map on the sign, and started up the well-marked trail. Jerry set a slow but steady pace, and we climbed gradually upward on the rocky ridge. The trail switched back and forth along the steep slope, so that we were not climbing straight up, but at an angle. Rains had washed out a lot of the dirt cushioning the rocks underlying the trail, so I was wary of ankle-turning narrow clefts. Still, the trail is wide enough to offer a variety of footing choices, and solid wooden water bars are placed every few feet to channel runoff away. I used my stout walking stick to provide a solid tripod stance whenever a foot slipped. When I was about twelve, my friend Mikkey and I formed a horseback drill team made up of about twenty of our 4-H friends with horses. Today I can find some of the forms we ran by searching the Internet for “horseback drill team patterns,” but we made our own diagrams and led our team into intricate maneuvers: figure eights, double circles, cloverleaves, loops and whirls. Each horse had to work with every other to perform at speeds that varied from a walk to a gallop. A light breeze ruffled my hair. I set each foot solidly before taking the next step, leaning forward into the hill the way I had leaned with the horse as we circled the arena. Dust rose behind Jerry’s steps, smelling just like the dust the horses kicked up as they trotted. When we worked out the drill team patterns, each horse and rider had to know precisely where each horse’s foot was at every moment. If we were riding a wheel pattern, the horses on the inside might be barely moving while the horses on the outside were cantering. None of us had fancy horses, just mounts who spent most of their time moving cattle. Like us, they seemed to enjoy the variety of working together to create these intricate configurations, and they all seemed to enjoy the applause. The sun shone high above us as we walked, and the ponderosa pine trees close to the trail had been thinned, so we could see between them a few feet into the mottled shade. Occasionally, though, an oak tree stood in a column of light, as if standing center stage. I paused to take deeper breaths and noticed prairie grasses under the oaks, among sage, yarrow and salsify plants. Diamond-shaped blue markers appeared at head height every now and then to show us the trail. Our hike settled into the slow process of lifting each foot and setting it down as I recalled the day I first hurt my knee. As leaders, Mikkey and I carried flags on tall poles which we set into our stirrups just ahead of our legs. For the pinwheel, we formed a long line which eventually split in the middle. As the two halves of the line rode toward each other, the horses on the inside turned in place but Mikkey’s Firefly and my Rebel, on the outside of the circle, first walked, then trotted, and then galloped as the riders crossed for the third time. We’d done this maneuver many times before and always grinned at each other as our horses swept past each other, the flags snapping over our heads. On that occasion, we were too close together. Our flags crossed. Her flagpole struck my knee. Firefly was slightly bigger than my little Arab, so the impact of the opposing flag slamming into me wrenched my hip sideways. I did the important thing for a horsewoman: I stayed on the horse. We finished our set and dipped our flags to the applause. I even got off the horse by myself, though I immediately collapsed and had to pull myself up by my stirrup. The next day my knee was the size of a basketball. My mother probably wanted me to see a doctor, but since I could walk, my father said my leg wasn’t broken. I limped for weeks. Remembering kept me marching up the trail behind Jerry, and even at our slow pace, we passed the steepest and most strenuous part of the trail within forty-five minutes. We paused at that height to listen to the traffic far below. Once in awhile, we glimpsed a car or two zipping along the hot asphalt, with no idea of the cool breeze on the ridge. Though the trail is marked for hikers only, we saw bicycle tracks, but met only other hikers. We strolled along the top looking at the crunchy pale green lichen on the limestone. 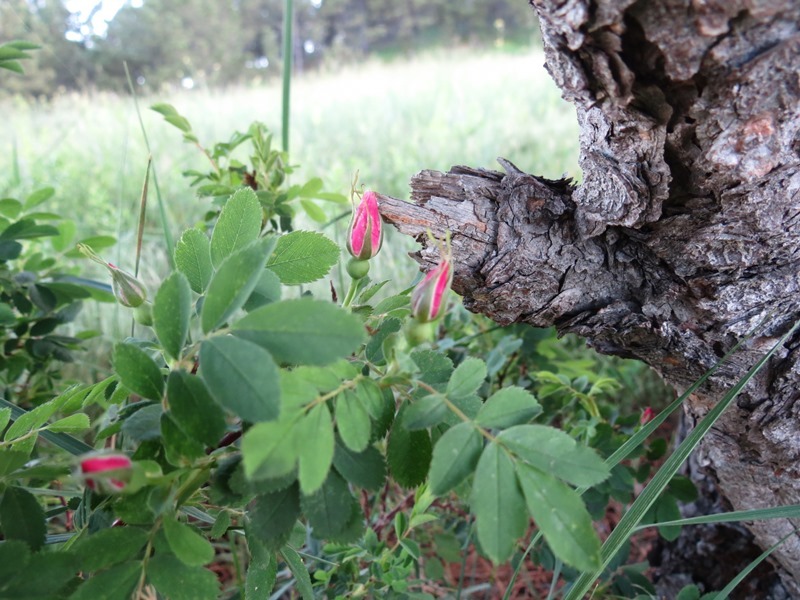 I saw a line of magenta flowers, like beads on a string, and could tell only that they belonged to the vetch family. 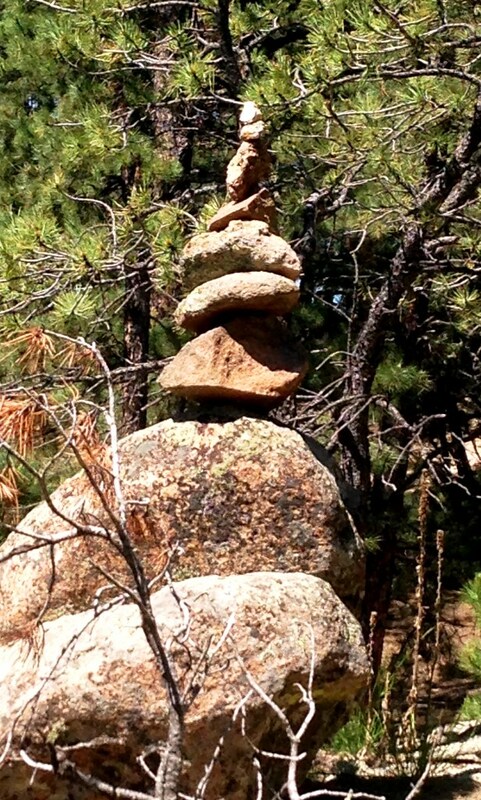 Jerry spotted a tall pile of stones twenty feet off the trail, artfully arranged and balanced like the stone johnnies used by early travelers as trail markers. While he took a picture, I sat on a rock and realized a tiny spring was seeping out from under it– not enough for a human drink, but a trickle that might allow small mammals– voles, mice, even birds– to sip delicately. Birds I couldn’t identify sang high above us, hidden in the pine branches. Along the trail stood the furry blooms of the Rocky Mountain pussytoes, or antennaria media, one of my favorite Hills plants since I identified it after reading Ed Abbey’s comment in Desert Solitaire that he liked it, “if only for the name.” The delicate flowers are white and clustered in a way that does remind one of a kitten’s toes– but what amuses me even more is thinking how some serious field botanist probably chuckled as he or she submitted the name to officialdom. Both above and below the trail, we saw depressions in the earth surrounded by stones and softened by a century of rain, evidence that the discovery of gold in 1874 not far from here brought hundreds of gold-seekers who probably climbed every ridge overlooking a creek to dig for treasure. They could not have imagined that we would be able to see where they worked almost 150 years later. 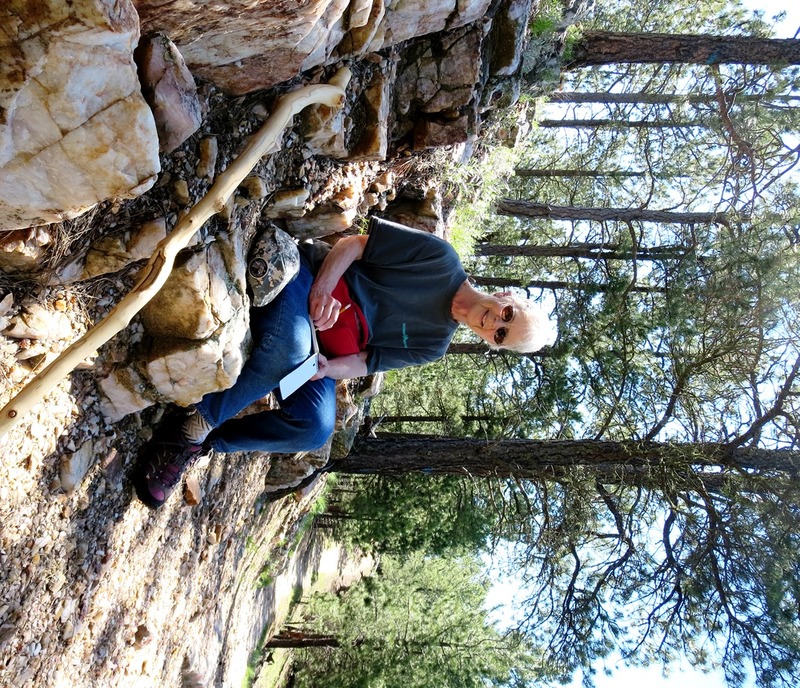 We stopped to rest by a huge outcropping of pink and white quartz where someone had been breaking rocks; glittering chips littered the trailside– perhaps a modern gold hunter, or someone illegally stealing the beautiful quartzite. At the trail’s highest point, 4,780 feet, is a sign, regularly painted afresh, that describes the park as “a place where one can still be an unworried and unregimented individual and wear any old clothes and sit on a log and get his sanity back again.” While the comment sounds like it might have been made by Charles Badger Clark, the state’s first poet laureate whose “Badger Hole” homestead is within park boundaries, no citation is given, and I have found no evidence it’s his. “Lovers’ Leap,” says another sign. The legend preserves the romantic tale that the promontory was named for two Indians who were in love but for some reason unable to be together, so they leapt to their deaths here. I wish my home state and nearest state park wouldn’t participate in such an embarrassing, prejudiced, and unlikely cliché. Wikipedia describes Lovers’ Leaps names in several other countries as well as 27 similarly named sites in the U.S.– not including this one. As Mark Twain sarcastically wrote in Life on the Mississippi, “There are fifty Lover’s Leaps along the Mississippi from whose summits disappointed Indian girls have jumped.” Did disappointed lovers among the settlers manage their heartbreak some other way? And couldn’t any of the early climbers of this summit think of another way to describe it? One could leap to a painful death from the top of the 200-foot cliff, but you might just provide practice for our well-trained search and rescue teams. I’m uncomfortable with heights, too, but I had no trouble following a sloping path upward on rough conglomerate rock worn nearly smooth by zillions of climbers. At the top, I stood in a circle of taller rocks with narrow openings between them; I had to lean out to see the broad sweep of the 1988 Galena fire, the Cathedral Spires, Harney Peak and Mount Coolidge. Tucked into crevices in the convoluted rock were the dead stalks of mullein, and tiny yellow rosebushes. A nighthawk circled and called above. The bowl formed by the rock lay sunny and warm; surely most pairs of lovers who visited it might find something to do other than leaping to their deaths. But I suppose someone would object to renaming the place Lovers’ Love Nest. While we rested, I sipped water, nibbled lemon-pepper chocolate, and flexed my knee, pleased to feel no pain. Jerry spotted a buzzard circling overhead just as I noticed another couple coming up the trail. As we headed down the west side of the ridge, we could hear Galena Creek bubbling below. I used my walking stick to keep my pace steady and smooth. Once we reached the creek, the trailside vegetation became lush, a tangled jungle of dewy foliage including birch and ash trees, blackberry bushes, Bicknell’s geranium, wild pink roses and many species I couldn’t identify. I did see Queen Anne’s Lace, which is really poison hemlock and resembles wild carrot closely enough to have killed a fair number of folks who forage for wild food. But it took me an inexcusably long time to identify the most striking plant along the creek, because the unusual moisture had created monstrous plants. The poison ivy was knee high in many places, lining both sides of the trail. The creek’s water spilled out of its banks everywhere, so sometimes we walked in soggy areas or detoured around piles of dead trees and other debris left by flooding. Watching the rushing water reminded me of the second reason I’d been nervous about this trail: I was afraid that in one of the numerous creek crossings, I’d reinjure my abused knee. I was in my second marriage on this second occasion, and my husband George and I were moving cattle to our winter pasture in January, when Battle Creek was partially frozen. I let the cattle move slowly, watching as they paced through the water and up the bank. When I tried to ride my horse, another Arab, named Oliver, into the freezing water, he balked and spun and sidestepped– dangerous moves on icy ground. So I debated. I did not want to walk into that freezing water wearing my riding boots, but the horse and I would both be safer if I led him through the creek. I dismounted and waded into the knee-deep water, cringing as the icy flow filled my boots. The horse followed quietly until I got to the narrow trail on the bank, worn three feet deep by generations of cattle hooves. I was looking at the slick mud of the trail, considering just stepping aside to let the horse climb out, when Oliver must have slipped on a rock and scared himself. He jerked back, so I let go of the reins and tried to scramble out of his way. While I was picturing that day, we’d arrived at the first creek crossing. To my delight, it was bridged with two stout planks set solidly into the mud, so I didn’t have to wade in the creek wearing my new hiking shoes. I tried to leap aside, but my boots were full of water and I fell in the path. I raised my arms up over my head, remembering I’d been told that a horse won’t walk on a human being. This horse was terrified, and he climbed over me. Later we found five distinct blue hoof prints on my left leg, plus a few more on my back and shoulders. The pain was terrific, but I could put weight on the leg so I assumed it wasn’t broken. While I sat on the ground recovering my wits, my leg flooded with warmth as broken blood vessels exploded. The warmth almost made up for the pain. I hobbled around for a couple of days before George insisted I see a doctor. He yanked on my leg a couple of times, said no bones were cracked or broken but that I had torn most of the ligaments in the leg– “much more painful than a break,” he assured me with a grin. He put my leg in a splint and gave me crutches and painkiller. Years later, after the leg had collapsed on me a couple of times, dropping me into an embarrassed heap, another doctor suggested an operation to repair the kneecap, but I declined. The second creek crossing was bridged as well, though we could see that the bridge had been moved because its previous location was under water. I practically skipped across it, carrying my hiking stick and thinking of Little John and Robin Hood. Sometimes, in order to get to the bridge crossing, we had to walk around flood debris that had been cut out of the creek and dragged away from the path. After crossing several of the bridges, we realized that these are a brilliantly engineered answer to a creek that hosts frequent floods. 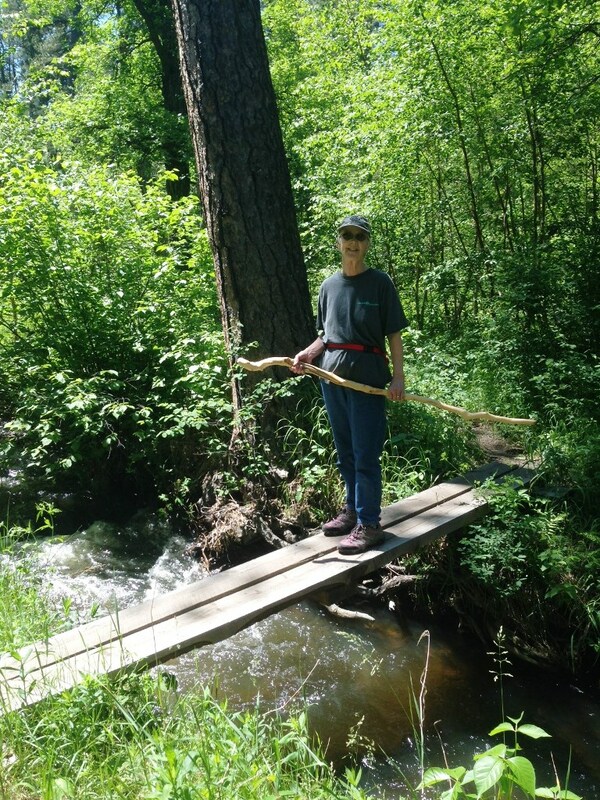 Most hiking bridges we’ve seen in other areas consist of two heavy planks laid across the creek. Each time the creek floods, trail crews have to find the planks and return them to the proper place, or haul in new lumber if the first bridge can’t be recovered. But not on Galena Creek. These bridges didn’t wash away because of their ingenious construction: one end of each bridge is chained to something solid, like a tree or rock. Floodwaters may lift one end of the bridge and swing it downstream, but workers won’t have to chase it; they can lift it back into place. Still, clearing the trail after every flood during a wet spring like this must be a terrific job; we were amazed and delighted by how easy the trail made our walk through this rugged country. After bridge number five, the creek passes below a soaring black cliff with water springing from a dozen cracks on its face. From the cliff’s top to the bottom where it plunges into a dark pool, several ecosystems, varying from ferns to sagebrush, thrive in niches. In this gorgeous place, I finally admitted to Jerry and to myself that making this hike was a good idea not only for my physical health but for my mental state. Still, it was several days before I understood how important the hike had been to my writing. All together, we crossed the creek ten times, marveling at evidence of the work it takes to keep up the trail. Anyone hiking immediately after a heavy rain might have a harder time before the trail crew gets there. Once we climbed over flood debris to reach a bridge, but several trees had been cut and moved aside and the maintenance crew probably planned to return. We never got in mud or water over our shoe tops. The end of the trail, after three miles, was confusing and a little disappointing. As the trail sloped downhill, we slowed down, sensing we were about to step out of the serene woods into the chaos of tourism in summer. But we still weren’t ready when the trail turned into a graveled, then a paved road among park cabins. We walked past several houses, feeling like intruders, until we saw a blue triangular marker. Soon we were engulfed in families hustling into the Coolidge Inn store, and laying out lunches on picnic tables; we followed the busy highway to the correct parking lot. As we finished the walk, we discovered and discarded the ticks we’d collected during the leisurely four-hour walk, and I made notes for this article. The next day I resolved to get myself back into my usual routine. During our vacation, I’d wondered whether it’s wise for me to insist on writing every day, but I constantly noted what we were doing and seeing. 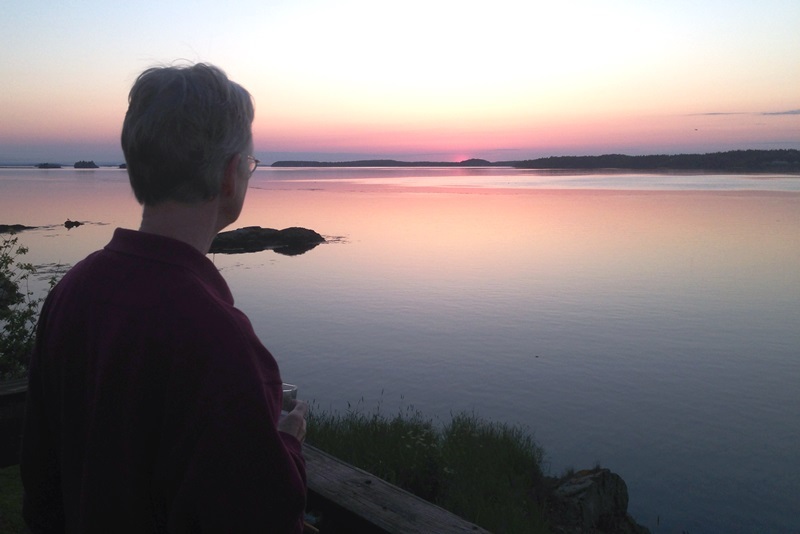 Some of my favorite vacation hours had been at dawn when I sat on the deck with my first cup of coffee, looking at the moving ocean instead of the waving prairie grass, letting my mind tell my fingers what to write with no limits. With no specific project in mind, I’d simply recorded my delight in the smooth oval white and round red stones of the beach. I’d tried to find a way to describe the way the water seems to flow out of the land, the way the cardinal sounded in the bush beside the deck. But when we returned home, I became immersed in the daily busy-ness that can overwhelm anyone, and let it carry me along. I told myself I need to take my writing less seriously, that with my experience, I didn’t need to write every day to keep my interest up. I kept busy with jobs I usually fit around my writing. I told myself each night that tomorrow I would write, until many tomorrows had passed. When I returned to my trip notes, I found them lifeless. Maybe, I thought, I’m finished. Perhaps I’ve said all I need to say. My husband George used to say, “Linda’s not happy when she’s not writing. And when Linda’s not happy, nobody’s happy.” After a couple of weeks of not writing, I found myself waking up grouchy, so I knew I had to do something. That’s when Jerry proposed the hike. I made myself do it, told myself it would be good for me. Of course, there may be good reasons we don’t want to do something. But sometimes we need to go ahead and do it anyway. The delight I felt in walking and taking notes on the hike reminded me why I write, but just enjoying the hike and taking notes wasn’t enough. The next morning I followed my own rule: I organized my day around writing and produced a draft of this article. As I re-read it that night, my mood dropped again: it was flat, listless, comatose, limp, tedious and a few more synonyms for lifeless. I went back, mentally, to that black cliff face, and looked up at the vibrant color of the plants that grew because they somehow tucked hair-like roots into granite slits. Writing something, and then perhaps getting it published, requires the same patient persistence as the feathery blue sagebrush needs to grow on that inch-wide ledge. Sitting around telling myself I might be finished writing was synonymous with telling myself I was dead. And apparently no matter how experienced a writer I am, I still need the discipline of a daily schedule. Some writers begin each day with a particular assignment, such as a haiku. I’ve never done that, but have advised my students to begin each day with writing something. It doesn’t matter what it is, I said; it’s the discipline of the writing that will carry them on to the next step. A person who writes a letter every day will be a better writer after a year. I believe that the simple act of writing makes us see what we might miss. As Norman Maclean wrote in A River Runs Through It, “All there is to thinking is seeing something noticeable which makes you see something you weren’t noticing which makes you see something that isn’t visible.” Seeing is writing. I can’t write if I can’t see. I broke my own rule. Over the next day or two, I made this essay my first priority of each day, revising and revising and revising. Perhaps in giving myself time off from writing I had just been lazy, avoiding what is, after all, hard work. My goal as a writer is to discover something in each writing I do, and to be able to communicate my discovery to a variety of readers. Even writing about a stroll through the woods requires patience and attention to detail if the goal is, as it should be, to help the readers visualize the action and gain something from the writing to enhance their own lives. Bill Kloefkorn, the late Nebraska State Poet, began his writing classes with an exercise he called “Finding the bulls eye inside the epiphany.” With his permission, I copied down his directions to use with my own students. First, write down a word or phrase that reminds you of a painful experience; possibilities for pain are not necessarily physical. If you can’t do that, then guess at it. If you can’t do that, lie. “If lying bothers your conscience, you will never be a writer,” says Bill Kloefkorn. Then ask questions about the word you’ve written down. What town were you near? Were there any lower animals with you? Any people? If it wasn’t too big, where was it tight? Were you outside or inside? If you were inside, what color was the wallpaper? What were you walking on‑‑ pavement, or another human being? After answering these questions, you should free-write on what you’ve come up with for 45 minutes or so. That is, put pencil to paper and don’t lift it for 45 minutes. It’s best to time this, because if you think you can estimate the time, you will be surprised how long it can be, and you don’t want to stop writing to look. From this writing comes material from which you might write almost indefinitely. This is torture, of course, even if you are writing on a computer. Work up to it: set a timer and write for 10 minutes without stopping, or even five. Bill told me his students sometimes spent the entire semester writing about whatever emerged from their writing on this day in class. They continued to break it down, and kept discovering “the bull’s eye inside the epiphany.” If you write enough on one topic, you eventually begin to dig down into subjects that are hard to write about, and that therefore matter. Another result is that the more specific sensory detail you include, the more the reader will identify with what you have written. This is an odd fact, but true: even if the dress you wore to your first day of school was long and blue while mine was red and short; even if your hair was long and black and mine was short and blonde– your specific memories will bring mine back to me, and I will then identify with what you have written. On days when you don’t have a specific writing goal in mind, write anyway. Put the pencil or pen to the paper, or your fingers on the keyboard and begin. Write through the gibberish and the advertising slogans; write until something more important begins to arrive from the depths of your mind. Only the discipline of writing was enough to lift me from the doldrums of not writing. I’ll try not to forget that rule again.